Discussion in 'General Discussion' started by Admin, Nov 19, 2018. Sen. Kamala Harris (D-CA) tweeted Sunday to claim no one is immune from gun violence and it is time for Congress to pass more gun laws. 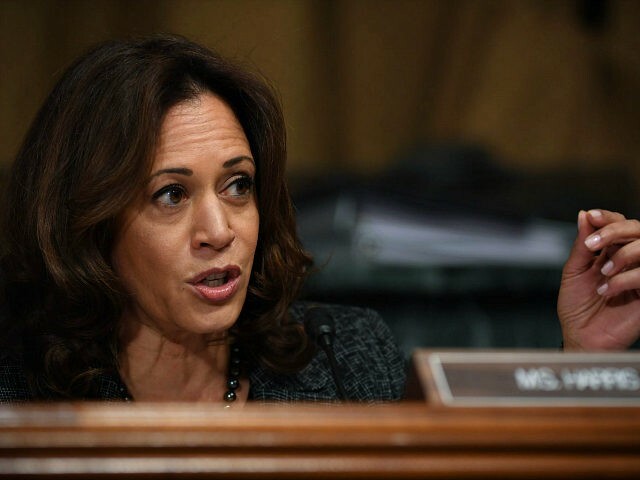 Harris referenced Parkland, the site of the February 14 attack that killed 17 innocents, Chicago, the city of relentless violence and death, and Los Angeles, where 14 people were recently killed in an attack at the Borderline Bar & Grill. Harris did not mention that Parkland was a gun-free zone, that Chicago has long been an experiment in gun control, and that the Borderline Bar & Grill is a state-mandated gun-free business. DruDang, Koolmoose, Lucus and 14 others like this. Roadglide, NorthShore, rogues and 4 others like this. After the Kavanaugh debacle, this total douchbag should never speak about anything again. But the attention whore she is she picks the low hanging fruit. xjma99 and Boris like this. Basically if the person has a D next to their name as a party affiliation they are anti 2a. xjma99, Uzi2, Boris and 3 others like this. Getting beat up bad on twitter -all good points and questions with no answers expected as usual. xjma99, Uzi2, JayMcB and 1 other person like this. Because all the D-RATS are just airbags and blobs. xjma99 and Uzi2 like this. Could any political party be opposed to any of the other enumerated rights and get away with it? xjma99, Uzi2 and Jason Flare like this. Because their policies simply don’t work. And they have absolutely no response to a rational conversation on this issue. They only win with emotional arguments. xjma99 and Jason Flare like this. Apparently. 4A is all but a memory. Funny how only 2A says “shall not be infringed” yet there are over 25,000 laws on the books that do just that! jpk, EJFudd and W.E.C like this. Can we trade universal background checks for machine guns? No surprise here. Democrats will do what they do best, throw away our hard earned tax dollars and try to strip us of our rights. It's time to pass term limits not more gun laws. mwalsh9152, Aaron[MA], quincy and 8 others like this. It's time to start holding these politicians accountable for violating their oath of office to uphold the Constitution. They've been getting away with their power trip for way too long. Lucus, W.E.C, Horrible and 2 others like this. Agree, "no one is immune from gun violence" but How you protect your life should be a personal choice. Yazz, Horrible, xjma99 and 1 other person like this. Ive said it before - the only reason they chirp about this is BECAUSE they can't get it passed. Notice Obama chirped often. Never had a bill submitted to Congress. Because IT WOULD NOT PASS. There are far too many people within Kamala Parker Bowles' own party that would vote NO on new gun legislation. She doesn't want that known. Saber-rattling. That's it. Koolmoose, xjma99 and StevieP like this. Guns for me but not for thee- I call for any security details she enjoys to be reassigned. Horrible, xjma99, Uzi2 and 1 other person like this. She needs to STFU and her constituents have their head examined for voting for this nagging ahole! Horrible, xjma99 and Uzi2 like this. We need universal background checks for all politicians and mandatory psych evaluations for them too. Lucus, Horrible, xjma99 and 2 others like this. Koolmoose, Horrible and xjma99 like this. Lol. They don't care about effectiveness. They care about feelings. They don't want private ownership of guns because they don't like the idea of not being able to force people to live the way they want. TLB, Horrible and xjma99 like this. Any security detail she enjoys should be subject to the same laws as she is proposing, before it passes. I think she’s just making talking points for 2020. She has nothing else to run on. Did anyone notice the Florida kids and Hogg fizzled out. Getting ready to go shopping, 1911 in holster ,extra mag in holder and knife is sharp . F her . I think I'd like to get with her. Yes, pass more gun laws........because the other 22,000 have worked so well. I do not consider ANY DEMOCRAT as an American. They can all go straight to hell along with their gun laws. Congress can pass anything they want, I'll abide by none of them. Bfatz, Aaron[MA], GM-GUY and 2 others like this. They do not have my consent to govern. GM-GUY, Horrible and Uzi2 like this. Yes, next to an open 7th story window!! She looks like she's spent 20 years in a boxing ring as a punching bag. The deer I just butchered had a more attractive nose on him. xjma99 and W.E.C like this.